Aaron Bjork, a PM on the Process team, has written a high-level blog post here: Team Foundation Server 2010 - Where Are My Reports? In this blog post I’m going to dive deep into the details on how to modify reports to work with the new schema. But first, some definitions and background. The dimensions in a cube are at the heart of what makes a cube useful for slicing data in many ways. Data values are associated with a set of dimensions, allowing you to show aggregate results sliced using a specific set of dimension values. Data that can be associated with multiple dimensions. This data may also be aggregated. Fact tables hold these values. Under each dimension you’ll find a set of attributes and possibly hierarchies (area and iteration are a hierarchies). Each attribute is connected to a column in the corresponding dimension table in the warehouse. Measures are values that correspond to columns in the corresponding fact table. You use this new window to edit and create data sources and report parameters. Editing of data sets is now done in a dialog box that you get to by double-clicking on a dataset, such as dsBugCount in the image above. This dialog box is the new location for working with query parameters, fields, etc. To edit the query, click on the Query Designer button. There is a limitation of this query designer that you’ll likely notice right away—whereas MDX in the 2005 Report Designer was formatted with syntax coloring, the new Query Designer has no formatting for queries, making it difficult to edit the queries. Copy the query from the Query section of the Dataset Properties window (which does have correct line breaks). Paste the query into a session of SQL Server Management Studio. 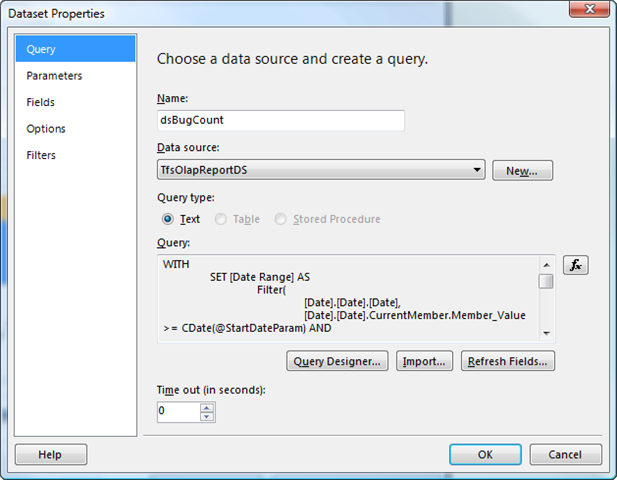 Copy and paste the modified query into the Query Designer dialog box for testing and saving back to the report. Updating a Team Foundation Server 2008 report to work with the 2010 version requires making a number of changes. The details of these changes are described in the following sections. The new names exist to accommodate upgrading a server where you have an existing set of reports designed for Team Foundation Server 2005 or 2008. Installing the new version creates a new warehouse and cube that use a different, incompatible schema. The new data sources point to the new warehouse and cube, without overwriting the previous data sources. The old warehouse and cube are not removed or overwritten when you upgrade the server so that old reports will continue to work. However, no new data will be added to the pre-upgrade warehouse and cube. Using new data source names allows the old reports, which use the old data sources, to continue to render pre-upgrade data. You’ll need to make sure reports that you upgrade use the new data source names so they’ll connect to the new cube. There is now a hierarchy instead of a flat list. For example, you can have a Team Project collection that has some projects under it. Team Project names are not server-unique as they were in 2008. A project name has to be unique only within a single collection. In other words, the same project name can exist in two different team project collections. That also means you need to use a different mechanism to obtain the default project associated with a report. In previous version, you could get the default project name from the report’s path and just use that to filter query results. But with team project collections and 2010, you need to use the project’s GUID instead of the name as a filter since the name by itself may not be unique. Create a parameter called ReportPath and move it so it’s the second parameter, after ExplicitProject. Create a parameter called ProjectGuid just after the ReportPath parameter and set the default value to results of the dsProjectGuid dataset. You will then need to modify your other queries to use the resulting GUID, which is covered below under Cube Improvements. For the first time, writing reports against the warehouse using SQL is officially supported. As a rule of thumb, you’ll generally want to use the cube for historical reports, or reports that require a lot of slicing and dicing using parameters of aggregate data. The cube is really good at this sort of work. The warehouse, on the other hand, allows you to create reports that pull loosely related data together in ways not possible with the cube. There are now a number of public views to help you work with the warehouse. All of these public views have names that end with “View,” such as WorkItemHistoryView. Views that begin with “v” and end with “Overlay” are used for processing the cube, and as such aren’t really meant for use in your reports. When you work with historical data in the warehouse, you’ll need to be aware of compensating records. You’ll find compensating records in tables/views that include historical information, such as WorkItemHistoryView. Whenever you modify a work item, a pair of records is added to the warehouse. One record “undoes” the most recent previous record, and the next record adds the new settings for that work item. The compensating records allow you use to aggregate functions like SUM in query results. That being said, you’ll get better performance if you use an “As Of” query instead of using SUM. Here’s how this works. We want to return only the last records for each work item that was modified before 5/16/2009. The System_RevisedDate clause ensures we retrieve only the last record that was modified before 5/16/2009 because it finds the one record that was both modified before and revised after this date (or not revised at all, in which case the date is in the year 9999). Additionally, you’ll notice this query tests for a positive RecordCount. Compensating records that cancel out a previous record always have a RecordCount of -1. One new feature of Team Foundation Server 2010 is the support for team project collections, which is a group of team projects. Entire team project collections can be moved from one server to another. As a result, the IDs of work items are unique only within a single team project collection, but they may not be unique on a server that contains records from more than one team project collection. That is why the query in the previous section includes a filter on the project GUID in addition to the work item ID. The table contains dimension data, which means the data will appear in the dimensions part of the cube. There is usually one column for each attribute or hierarchy that belongs to the dimension. The values of cells in the cube, which show up via measures. 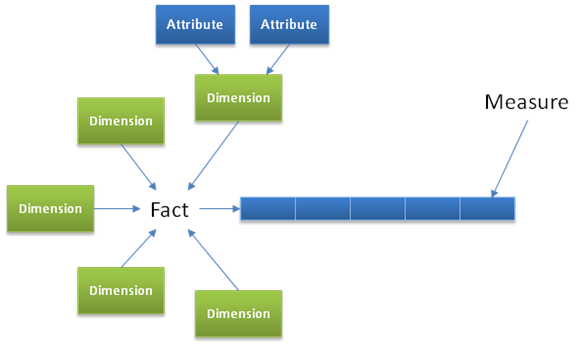 Fact tables have foreign keys to various dimension tables. 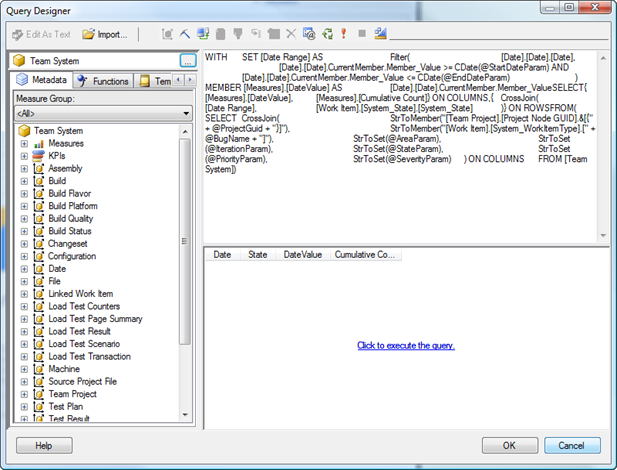 As an example, the FactWorkItemHistory table contains a column called StateChangeCount that appears in the cube under measures, in the Work Item History measure folder. Additionally, the DimWorkItem table shows up in the dimension hierarchy under Work Item. Renaming the tables this way makes it easier to see the connection between tables in the warehouse and their corresponding entities in the cube. Previous versions of the cube had a lot of dimensions, a little over 60. The new cube has been restructured to use less than half the number of dimensions. Yet at the same time, there are more ways to slice than before. This “simplification” was achieved by changing what were dimensions in the old version to attributes on closely related dimensions in the new version. For example, the Activated Date dimension became the Activated Date attribute inside the Work Item dimension. Additionally, because the number of attributes on a dimension can be quite high now, many of the attributes are grouped into attribute folders. Area and iteration used to be dimensions. Now, however, you’ll find area and iteration hierarchies within other dimensions, such as Work Item and Test Result. You’ll need to use the appropriate hierarchy in your query. For example if you’re slicing on test results, you’ll need to use the area/iteration hierarchies within the Test Result dimension. Because areas and iterations were changed to become attributes and the project name is no longer unique, the queries for the area and iteration parameters are very different from before. If your report has parameters for area and iteration, you’ll need to modify or replace your queries to use the new structure. In this section you’ll find queries we’ve created for area and iteration lists and default values. The old structure used a parent/child hierarchy that allowed you to use the project name as a key, making it easy to get the list of available areas and iterations for a team project, as well as the default values. In the new structure, team project names are not guaranteed to be unique, so using the project name as a key might give you results for more than one team project. Additionally, the hierarchy is now a natural hierarchy rather than a parent-child hierarchy, which means that you don’t have data members that represent a node without children. Instead, the new hierarchies have the equivalent built into the hierarchy so the queries don’t need to check for DATAMEMBER values and format them differently (by enclosing them in parenthesis). The queries to get the default area/iteration return a single member based on the project GUID by looking only at the direct children of the root. Limiting the scope to just the children of the root keeps the query fast. 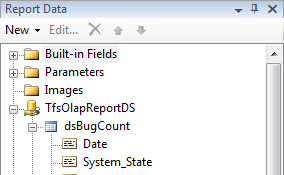 This data set uses as input the results from the dsAreaDefault query so it will scan only areas in the current project. Limiting the scope to just the children of the default area significantly improves performance of this query. This data set uses as input the results from the dsIterationDefault query. You’ll need to modify all uses of the project name to use the GUID instead. The old version is on the top, and the new version is on the bottom, with the changes highlighted in yellow. Many of the reports used the MDX WHERE clause to slice the data on team project, as well as other dimensions. However, this doesn’t always work with SQL Analysis Services 2008 because of changes in how queries are processed. Additionally, it’s not as fast as it could be because the slicing is done after the query body has been processed. query on Iteration default and Iteration are exactly same. Can you help with the proper query for the same. Are there any sample reports for TFS2010 apart from the reports that are provided with TFS2010. I tried importing some reports from previous versions of TFS, but could not run them. Any help is appreciated. We're trying to upgrade from TFS 2008 to TFS 2010 Beta 2 and it has been a rather time consuming adventure. The upgrade path really needs to be much smoother with much less hands on intervention. We've run the upgrade wizard after quite a few attempts managed to get the work items and source control working (I think) and are now trying to get our existing reports working. Do you have any more step by step walkthroughs of how to change a report and what tools you need to use. For example in the Reports Location in Part I you mention a stored procedure to get the GUID and mention ExplicitProject as a parameter but can't find a matching combination for this. We found a table value function called GetProjectNodeInfoFromReportFolder but has a param called reportingServicesReportFolder. Having to 'Hack' these Reports at such a level seems very wrong. It's becoming a bit of a nightmare - we're trying to use the Conchangeo SCRUM for Team System version 2.2 and they seem to have no upgrade path from their 2.2 templates to the new version 3. Is the only 'real' solution to just start from scratch and lose our existing Team Projects. I am thinking may be i have move this report from one location , any help in resolving will be appreciated.